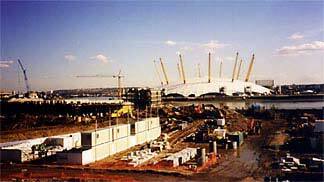 The 768 million Millennium Dome, the world’s largest enclosed space, opened on the first day of the new millennium, January 1, 2000. In the dome’s center was a massive stage area which presented multi-disciplinary performances attempting to tell the story of humanity. Arranged around the perimeter of the dome are 14 themed zones which celebrate British ideas and technology and examine crucial choices facing mankind in the new era. The Millennium Dome was the centerpiece of all Britain’s Millennium celebrations, but failed to draw the crowds predicted. Originally, some suggested that the dome be torn down, but a proposal for a high-tech business park be erected under the tent area, creating an “indoor city” complete with streets, parks, and buildings was agreed and the O2 was born. The business park was actually the original 1996 proposal for the site of the peninsula before the plans for the Millennium Dome were proposed. 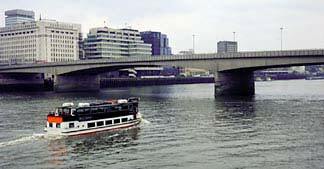 This fabled bridge across the Thames River, noted in story and rhyme, has a colorful and continuous history that dates back to Roman times. The first London Bridge was built by Romans sometime after 43 AD and some of its wooden remains have been uncovered on the north side of the river. During its life the wooden structure was renewed several times. At one time, one of these structures was washed away by a flood, and another was torn down by invading Vikings, led by Olaf the Norseman in 1014.